Texas Star Roofing offers professional siding installation for chimneys, walls, or even your entire house. We specialize in James Hardie fiber cement products that offer a 50-year warranty and reduce the frequency with which you have to paint because the paint adheres much better than on wood. We can do the siding installation in conjunction with your roofing project or as a stand alone project. You’ll be amazed at how much better your house looks with a new skin. Ask us for a free estimate for roofing or siding for your home in the DFW area. Just complete the form on the right side of this page or call us & we’ll connect with you to arrange the best time. Fiber Cement Siding: What are the Benefits? When evaluating the overall appearance of your home, the most prominent feature of your exterior, the siding, is inevitably where your mind must go. You have a lot more options than you might think. Anyone who wants to take into consideration the economics must consider fiber-cement siding as a viable choice. Fiber-cement siding is similar to conventional siding in that it is put on the exterior of homes to improve the look and protect it from the elements. 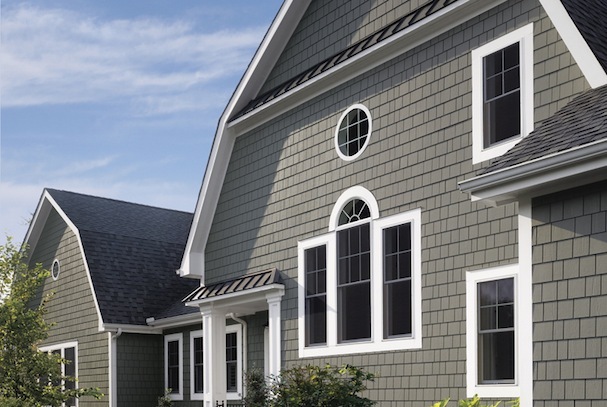 Like other siding, it can come in a huge range of colors and styles. It can look like cedar shingles, stucco, or wood clapboards. It is actually made from a combination of sand, cement, and wood fiber, making it quite durable. Fiber cement siding resists wind, fire, insects, and rain better than most alternatives. It is recommended in pretty much any climate you can think of. It doesn’t rot, unlike other siding options. Because it is made mostly of cement and sand, it is immune to termites. In addition, fiber-cement siding doesn’t contract and expand like wood siding, which means that paint can stay in place better. It hardly ever blisters or peels, which can significantly reduce the maintenance costs. Call our professionals for advice, or complete the form to schedule your free, on-site roof inspection by Texas Star.